Even as the IMD has begun issuing city-specific temperature alerts, over 150 people have reportedly died due to heat strokes. Is our health infrastructure ready to make use of the forecasts? For the first time in its 140 year history, the India Meteorological Department (IMD) has issued temperature advisories for heat waves from April to June. The advisories include an early warning, akin to the ones issued for heavy rains and cyclones. The forecast is for 15 days at a time, with updates every fifth day. It also includes specific temperature forecasts and alerts for up to 100 cities and towns across the country. While governments and researchers have focussed on the changes in monsoon patterns due to climate change, efforts to counter the impacts of heat waves had been virtually non-existent. The National Disaster Management Act, 2005, and the National Policy on Disaster Management, 2009, do not consider them to be a natural calamity. The government, therefore, does not devote financial and infrastructure resources to the problem. This despite the fact that heat waves are the third biggest cause of death in India (see ‘Natural killers’). According to the National Crime Records Bureau, heat strokes caused 16,000 deaths between 2000 and 2014. Just in 2015, an abnormally long heat wave caused over 2,241 deaths in the country. With El Niño expected to be on the wane this year, the heat during summers in India (and in large parts of Asia, Australia and southern Africa) is likely to be severe. With researchers predicting that heat waves will become increasingly severe and frequent, government agencies at Central, state and local levels have begun to take note of the problem. “We now have the capacity to issue city-specific forecasts, alerts and warnings and plan to roll out an expansion to several cities in the near future. While the advisories can help improve vital services in agriculture, processed foods, water and energy, the biggest benefit would be the support they will provide to healthcare professionals and the public health system during heat waves,” says Sivananda Pai, head of the Long Range Forecasting division at IMD. Since heat waves are often caused by a combination of local and large-scale climaticfactors and are captured more accurately with localised forecasts, city-specific advisories are likely to be a great help for the agencies involved. 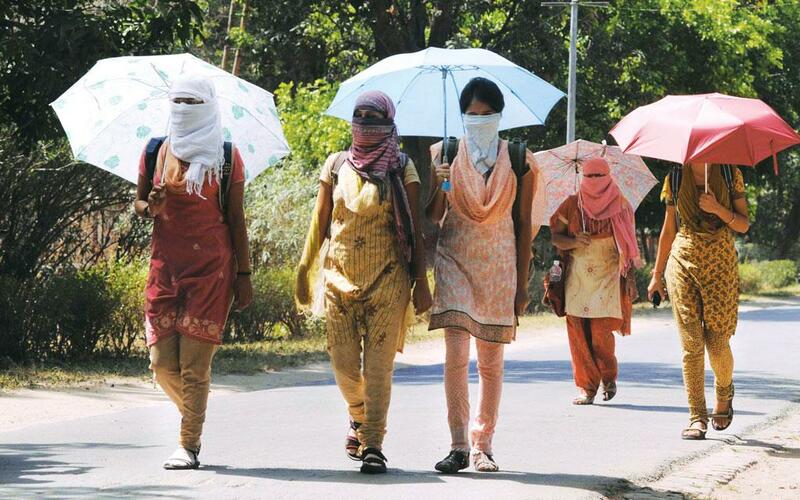 Initiatives to deal with heat waves have mostly come from state governments. For instance, following the devastating heat wave of 1998, which claimed over 2,000 lives in Odisha, the state put in place district-level disaster management centres. Similarly, after the 2010 heat wave that caused 1,344 deaths in Ahmedabad, a City Heat Action Plan was launched in 2013 to improve public awareness and promote inter-agency coordination. In mid-March this year, Nagpur and Bhubaneshwar also launched their own city-level plans. “The experience with Ahmedabad has been very positive. Local authorities are increasingly realising the requirement of a plan. City-specific data from IMD will immensely help in generating warnings and predicting heat waves because it allows better use of vital local factors such as humidity. In coming years, there are several new cities that we will assist in making such a plan,” says Anjali Jaiswal, director of the India Initiative at New York-based non-profit Natural Resources Defense Council. The non-profit has been a consulting partner in all the three action plans (Ahmedabad, Nagpur, Bhubaneshwar) that have been devised so far in the country. The difficulty in linking mortality to heat wave makes the task of formulating and implementing relief measures difficult. For instance, Andhra Pradesh announced a compensation of R1 lakh to the kin of those who had died in the heat wave last year. But a majority of the families were denied the compensation on the ground that the heat wave could not be established as the cause of death. “Medical practitioners determine the cause of death on the basis of most evident symptoms, which may be of some underlying condition. They often fail to recognise the role of heat. For example, a person with cardiac problem would be adjudged to have died of a cardiac arrest even if the cardiac arrest was caused by exposure to heat,” explains Dileep Mavalankar, director of the Indian Institute of Public Health, Ahmedabad. “The best way to ascertain the link is to check the body temperature soon after death and analyse for any correlation between heat and mortality,” he adds. The difficulty in linking cause of death and with heat waves has led to a huge underestimation of heat wave-related deaths in the country. This could also be the reason for the huge discrepancy in the number of deaths associated with the disastrous 2003 heat wave that struck Europe and killed over 70,000 and the 2015 Indian heat wave in which 2,241 people died. Both the events were of comparable duration and intensity. In government records only deaths due to “heat strokes” and “heat exhaustion” are counted as heat wave deaths. Heat, however, can cause death in several ways—from organ failures to strokes. “Heat strokes can be either exertional or non-exertional. Exertional strokes happen due to physical exertion in intense heat and the effect is immediate. But non-exertional strokes are caused by stress on internal organs due to constant exposure to heat. They exacerbate existing medical conditions and the effects are not immediate. Due to a time lag between the death and the heat wave, the link is less apparent and more difficult to establish,” explains Mavalankar. Experts also say that the most common victims of heat waves are also the ones that are least likely to benefit from government initiatives. “We have found that slum dwellers and labourers in big cities are the most susceptible group. They are also least likely to enjoy the benefits of action plans and technological innovations,” says Vimal Mishra, associate professor at the Indian Institute of Technology, Gandhinagar. Mishra has extensively studied trends and health impacts of heat waves. “Unless relief measures target them, we cannot hope to curb deaths due to heat waves,” he sums up.